The aim of this study is to evaluate the effect of kyphoplasty, compared with that of vertebroplasty, for the treatment of osteoporotic vertebral fractures, based on an overview of published reviews. This study is a literature review of systematic reviews on the effects of kyphoplasty compared with vertebroplasty. References were retrieved electronically from the MEDLINE (via PubMed), Cochrane Database of Systematic Reviews and Google Scholar databases. Participants: Patients with osteoporotic vertebral fractures. Outcomes: All clinically relevant outcomes. Types of study: Published systematic reviews. Our search strategy yielded 31 records of systematic reviews, selected by title. Among these, the following reviews were analyzed: three reviews comparing kyphoplasty versus vertebroplasty versus conservative treatment;   three reviews comparing kyphoplasty versus conservative treatment;   and six reviews comparing kyphoplasty and vertebroplasty. Head-to-head comparisons of vertebroplasty versus kyphoplasty were the object of this analysis. Because there was an overlapping of the reviews above mentioned, the final number of studies evaluated was 9 ([Fig. 1] and [Table 1]). To compare clinical/radiological outcomes and complication of KP/VP. To analyze the collected body of evidence regarding the efficacy and safety of KP in the treatment of VCFs. Short-term and Long-term VAS scores were evaluated. The result showed a significant difference favoring KP. The results of a retrospective analysis of KP versus vertebroplasty in tumoral VCFs show that, globally, no significant differences are found between the two techniques in terms of pain relief. VAS pain was significantly reduced with KP at 3, 6, 12 and 36 months follow up (p < 0.001). These reductions in pain were greater (than those observed at the same point in time with medical care treatment). No significant differences in the rate of postoperative fractures. Cement leakage to the intraspinal space was more frequently observed in the VP group (p = 0.35). Evaluation of the 19 studies that contribute data shows a total of 134 cement leakages in 1,742 treated levels, out of which only 1.5% are described as symptomatic or cause clinical sequelae. Combined analysis of two comparative studies showed that patients subjected to kyphoplasty are at a significantly lesser risk of suffering new fractures 6 months after the procedure than patients in the comparator group studies subjected to medical management. KP: A total of 171 new or incident fractures were reported in 1,151 patients across 16 studies, 110 (64%) of which occurred in the vertebrae adjacent to the procedure. To evaluate the safety and efficacy of (KP) compared with (VP) and provide recommendations for using these procedures to treat (VCF). VAS: The short-term subgroup found that KP was more effective than VP, but subgroup analysis of long-term did not find a significant difference between the VP and KP groups. Long-term postoperative kyphosis angles. The RCT and cohort study subgroup analyses found that the mean long-term kyphosis angle of the KP patients was significantly smaller than the angle of the VP patients. However, CCT subgroup analysis did not find a significant difference between the KP and VP patients. Cement extravasation, reported as an event rate, was significantly less frequent for KP, than for VP. Cement leakage: the pooled analysis showed that there was no significant difference between these two interventions. To evaluate the clinical effectiveness and cost-effectiveness of VP and KP in reducing pain and disability in people with VCFs in England and Wales. Four studies reported changes in BH and/or angular deformity. However, because of because of heterogeneity, the data was not pooled. Cement leakage occurred for 41% and 9% of treated vertebrae for vertebroplasty and kyphoplasty, respectively. New fractures of adjacent vertebrae occurred for both procedures at rates that are approximately equivalent to the general osteoporotic population that had a previous vertebral fracture. Abbreviations: CCT, controlled clinical trial; KP, kyphoplasty; RCT, randomized controlled trial; VAS, visual analogue scale; VBH, vertebral bone height; VCF, vertebral compression fractures; VP, vertebroplasty. Fig. 1 Prisma flow diagram of evaluated studies. The latest review was published in 2016, and included 4 randomized trials, 14 prospective cohort studies, and 14 retrospective cohort studies for analysis. The second most recent review identified two randomized trials. The study conducted by Bae et al used Cortoss (Orthovita, Malvern, PA, USA) cement as the spinal fill method, and was thus excluded from our analysis, as all other studies used methyl methacrylate cements. Wang et al identified only one randomized trial. Taylor et al (2007) evaluated five comparative studies, several non-comparative prospective studies, and no randomized trials. Hulme et al (2006) also did not assess any randomized trial. Most of the analyzed studies were retrospective (37); 25 were prospective; and did not describe their designs. 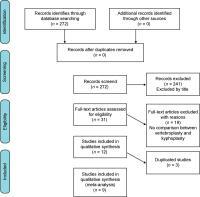 Hsieh et al (2013) reviewed not only primary studies, but systematic reviews as well. In 2014, a health technology assessment of percutaneous vertebroplasty and kyphoplasty was published by a UK group. The authors identified nine randomized trials. Out of these, only one (Liu et al) directly compared kyphoplasty and vertebroplasty. As stated by the current evidence regarding overviews of systematic reviews, it is possible to choose the last or the best existent review to be used as the main source for a final review. As the revision of Liang et al included all the described studies present in other revisions, this revision was selected for the data analysis, ensuring that there was no data duplication. Data are presented in [Table 1]. Regarding the clinical outcomes of both techniques, the pooled analysis revealed a statistically significant difference favoring kyphoplasty compared with vertebroplasty in the short-term and long-term VAS, yielding lower scores than vertebroplasty. The difference, however, was insufficient to achieve clinical benefit. The minimal clinically significant difference in short-term ODI scores varies in the literature, but 17 points favoring kyphoplasty has been considered as clinically significant. The kyphosis angle in the immediate postoperative period was evaluated in 15 studies, and showed greater improvement in the kyphoplasty group compared with the vertebroplasty group (-2.5; 95%CI -2.16 to -2.84; p < 0.01). The kyphotic angle in the late postoperative period was assessed by 9 studies, and the kyphoplasty group was again superior to the vertebroplasty group. The clinical and radiological outcomes are briefly summarized in [Table 2]. Abbreviations: KP, kyphoplasty; ODI, Oswestry Disability Index; VAS, visual analogue scale; VP, vertebroplasty. In all analyzed outcomes, kyphoplasty was superior to vertebroplasty. There were lower scores in visual analogue scale (VAS) and Oswestry disability index (ODI), and better increase in the height of vertebral body and in the kyphosis angle. 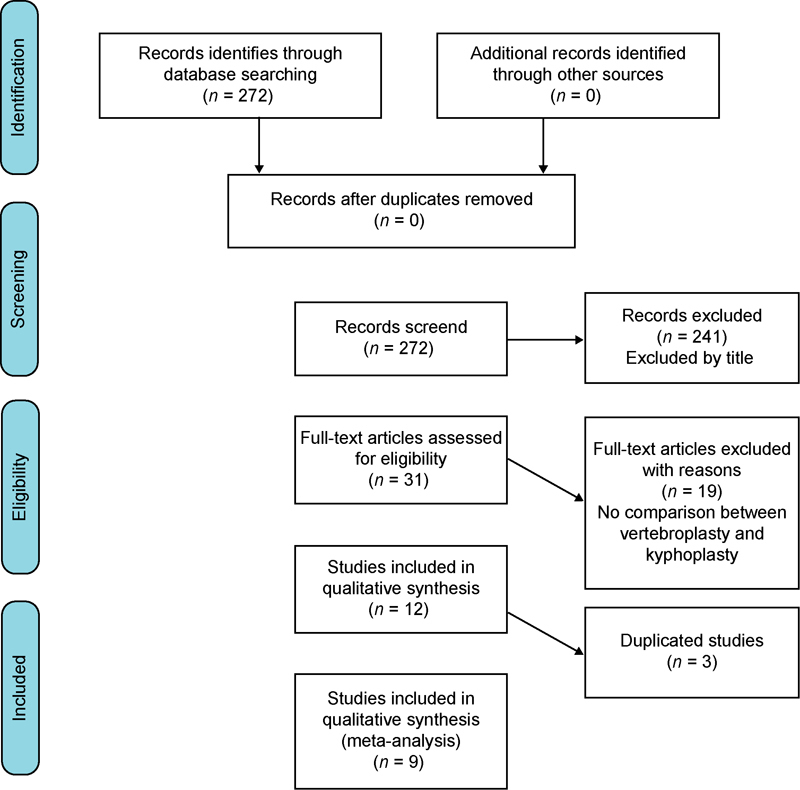 In our literature review, we identified three systematic reviews comparing kyphoplasty versus vertebroplasty versus conservative treatment, all limited to randomized studies. Only one randomized study comparing both techniques was described. Regarding the clinical outcomes of both techniques, kyphoplasty was superior to vertebroplasty in short-term and long-term VAS and short-term ODI, yielding lower scores than vertebroplasty. Pain control was more effective with kyphoplasty. Regarding radiological outcomes, kyphoplasty achieved greater differences in the height of the anterior third and middle third of the vertebrae, reflecting better reestablishment of the bone architecture. The kyphotic angles in the immediate and late postoperative period were also significantly lower in the kyphoplasty group compared with the vertebroplasty group, which is consistent with greater correction of the deformity. Osteoporotic deformities are another factor that contributes to pain, discomfort, and impaired quality of life. Promoting optimal correction of the deformity has direct implications for pain management and spinal sagittal imbalance correction. Kyphoplasty was superior to vertebroplasty in correcting deformities in the sagittal plane. Cement leakage and adjacent vertebral fractures were evaluated as complications. Leakage of cement into the vertebral canal and extraspinal spaces was significantly more frequent in the vertebroplasty than in the kyphoplasty group. Conversely, fractures in the adjacent vertebral levels were reported in few studies, without evidence of a significant difference between the techniques. Complications arising from vertebroplasty may be classified as mild (temporary increase in pain, transient hypotension), moderate (infection, leakage of cement into the foraminal, epidural, or dural space), or severe (cement leakage into the paravertebral veins, pulmonary embolism, cardiac perforation, cerebral embolism, or even death). Leakage of cement into the epidural or foraminal space is considered a rare complication. However, as most cases are clinically silent, the true prevalence may be as high as 40%. Paraplegia due to a cement-related spinal cord compression may occur in 0.4% of patients. Needle traversal of laminae instead of the pedicle can occur, especially in the thoracic vertebrae, where the pedicle is smaller; this can lead to catastrophic complications. The optimal method should concentrate the deposition of bone cement into the vertebrae, preferably supporting the middle and anterior thirds of the spinal column, which are the main sites of bone loss. Furthermore, the ideal method would isolate the cement from the rich neurovascular structures in the vicinity. In this line, the vertebral canal and extravertebral cement leakage rates were lower with kyphoplasty than with vertebroplasty. Therefore, the current evidence supports that kyphoplasty has superior efficacy in terms of clinical and radiographic outcomes and is associated with fewer complications than vertebroplasty. This study is limited by the absence of a definitive guideline for conducting literature reviews of systematic reviews. Instead, we modeled our design after suggestions and published guidelines. Furthermore, we evaluated all the available reviews, but only the last one (Liang et al) was chosen as a parameter, as it was the most recent and robust, and it contained all the published studies of interest. New randomized trials should be encouraged to analyze larger samples of patients and assess the heterogeneity of effects.